In 1521 Martin Luther was hid in the castle Wartburg on the cliff above Eisenach in Thuringia. He used the year to translate the new testament into German. Outside the assassin’s assassin cheated. Luther drowned the ink horn in the wall to believe there was the devil. Wartburg. Embedded image. Click to Wkipedia. In 1970 Wartburg became the place for such a fierce battle, between Carl-Gustaf Svingel and church dignitaries led by Archbishop Ruben Josefsson. In order to strengthen the contacts between the Lutheran churches, the war was held between the Nordic-German Convention, alternately in the north and in the two German states. The easiest thing was in East Germany because their delegates were often prevented from leaving. Host for the reception ceremony for the Nordic-German Convention in 1970 was the DDR State’s Church Affairs Director, Hans Seigewasser. To everyone’s surprise, Carl Gustaf Svingel, in his company, had faithfully dominated the scene. A single retirement home administrator at a DDR Potential, as a friend, of course. It took house in hell with the archbishop with other Nordic priesthood members. 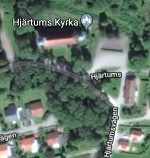 Vicar Jansson was not allowed to attend the convention. He had declared persona non grata in the DDR since 1963 since he discovered with refugees in the Jaguar drawer when they passed Checkpoint Charlie. Svingel took over the church’s commitment to the eastern side. And now the Swede fought with DDR bureaucrats with influence over the ban. The question was who could infiltrate who, the GDR or the Nordic churches. 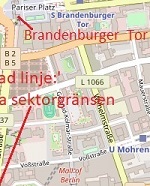 The Stasi agent Alexander Radler came to Lund in 1968 for a career as a priest in the Swedish Church. Prospective Archbishop Atje Jackelén featured for him in Christian ethics. On the other hand, the churches in the DDR became a haven for the civil movement before the wall was demolished after 1989. Svingel up to the DDR regime, or at least a useful idiot? It did not seem enough for Svingel to be guided by anyone. That he was an anti-communist even knew Stasi. The kruxet was a church and political network of contacts on both sides of the zong border aroused envy. In Leipzig he lived with acute theology professor Ernst Sommerlath , uncle of a future queen. 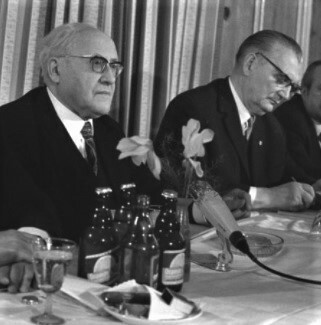 When Svingel delivered supplies every second week, he contacted the Evangelical Eastern Church Secretary General Manfred Stolpe , which led to Hans Seigewasser, State Secretary for Church Affairs. Certainly a Communist delegate in the Volkskammer but since the time in the concentration camp Sachsenhausen . Every month Svingel Seigewasser met at a restaurant at Unter den Linden. Svingel got OK to bring in supplies to the eastern churches. Religious literature, such as at the 450th anniversary of Luther. Svingel filled in a nasty extra and received 4 500 books. 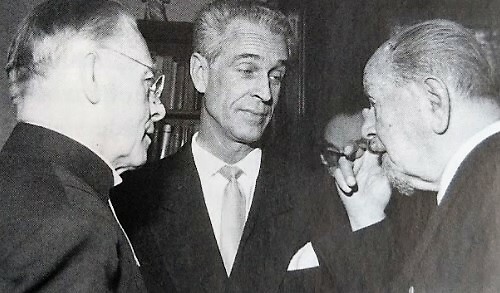 From the right: Hans Seigewaisser and Communist-bishop Moritz Mitzenheim in Thuringia. Click to source Wikipedia. Friends? Immediately a symbiotic relationship. Seigewasser was, as State Secretary for Church Affairs, a tool for the DDR regime’s eloquent effort to control the churches. Previously, they were fairly free from the state. Formally, the DDr church was linked with the faith brothers in West Germany and was largely financed from there. Svingel was then an important courier, because Germans on both sides were prevented from crossing the border controls. At the same time, Seigeweisser was grateful to Svingel, who had bought his son Günther from a GDR prison – for further transport to Sweden. He was sentenced to a long punishment after the 1960s had been kidnapped from West Berlin. Swedish and Norwegian bishops lobbied with their East German colleagues in order to ”deny all representations that Svingel would represent a Swedish organization or authority”. Seigewasser was also processed, which, according to church minister Jansson, believed that Svingel appeared as a Swedish diplomat under the cover of the Lutheran World Federation. Such undercover felt naturally for an East German apparatchik. Secret memo notes ”Even had talks with senior churchmen in East Germany proved all the necessity of a change in Svingel” status ”stop his ambiguous and unclear versamhet, before he causes more damage” . The critics were in favor of the argument that the Swedish Church’s money needed better elsewhere than recreating German ages. It was clear that refugee trafficking was not really part of Svingel’s mission as a leader. Unethical was considered. ”Finally, it became commercial all the way. It was true trafficking in human beings with different rates for whether it was a professor, officer or worker. ” Heribert Jansson considered shortly before his death in 1996. Ebbe Arvidsson resigned 1970 Åke Kastlund as director of the Swedish section of the Lutheran World Federation. In a meeting at Haus Victoria, they decided that Luther’s help would withdraw from Haus Victoria at the end of the year. With such a petty pair as Svingel and Heribert Jansson, the idea was abandoned that the Victoria Assembly would take over and sell the business. The hope was given to the charity organization of the German Evangelical Church, which was called Diakonische Werk. Without hiring Svingel as Kastlund wrote in a board record. Economic realities ruled but the primary was to get rid of Svingel. The Archbishop’s trusted in Uppsala did not know what powerful friends Svingel had. Paul Wee, authority on inter-Jewish relations in the international Lutheran community, took Svingel in defense in a long letter to Åke Kastlund for forwarding to the archbishop. After speaking with Svingel and others concerned in Berlin, he states that the good relationship with Seigewasser has opened book import and passport for the churches, which has not been possible for anyone else. ”Sven Backlund, now a sailor ambassador to Brussels and former Svingels’s gunman when he was General Consulate in Berlin, processed his political contacts. In May 1971 writes SPDs group leader Herbert Wehner to General Åke Sjölin in Berlin: ”Ber General Sjölin do everything he can to Svingel humanitarian work can proceed unimpeded and unrestricted” . The winding up of Haus Victoria was lifted. Sjölin was chairman of the church council of the Victoria Assembly, and one of the leaders of the West German government and perhaps also Lutheran World Women’s Fund was central. A local church council suddenly became big politician. Bishop Bo Giertz in Gothenburg accepted Sjölin’s proposal to become Chairman of the Swedish Lutheran Assistance, as a compromise between the contenders. About the Archbishop of Wartburg, houses in Helsike called the Swedish opera singer Gud in the letter to Giertz. Svingel’s wording almost netted biblically: Haus Victoria is a blessing source of God for the despair of old and captive souls . What was behind the cryptic wording? Did the old-age governor kill himself and become a martyr too much for the Swedish Church? With Giertz as chairman, Haus Victoria received a respite. And thus also respite for a hard-headed Svingel who used to greet his mentor Giertz in Gothenburg during the summer trips to Hjärtum. The following year, Diakonisches Werk took over the funding, until 1984 when the retirement home was sold and the couple Svingel / Imma Grossmann retired in an apartment on Fasanenstrasse near Kürfurstendamm. Then there was Wolfgang Vogel, Svingel’s DDr counterpart in the negotiations, put on the shampoo. Wolfgang Vogel and his wife Helge put a short time in the hands of Moabit, the prison from which the lawyer previously acquitted prisoners. The processes broke down the lawyer despite the fact that he was almost completely detained from refugees in 1998. ”Meine Wege were niece weiß und nicht schwarz. Sie mussten grau signal ”. Neither white nor black without gray. Then Vogel commented on his political flexibility. Folke Bernadotte negotiated with Heinrich Himmler. Raoul Wallenberg with Adolf Eichmann. Sleeping with the enemy often has a high price.